Thematically, like any good myth, the Harry Potter story comes full circle, with a heroic homecoming and the promise of more adventures, if only in our imaginations. 130 min. Warner Brothers. Director: David Yates. Cast: Daniel Radcliffe, Rupert Grint, Emma Watson, Ralph Fiennes, Alan Rickman, Michael Gambon, Tom Felton, Matthew Lewis, Helena Bonham Carter, Maggie Smith, Warwick Davis, David Thewlis, Clemence Poesy, John Hurt, Gary Oldman, Jim Broadbent, Julie Walters, Jason Isaacs, Kelly MacDonald, Ciaran Hinds, Helen McCrory, Miriam Margolyes, Gemma Jones, David Bradley, Emma Thompson, Robbie Coltrane. Harry Potter has left the building! Like Elvis, the boy wizard attained iconic global status across media platforms. And no doubt, Harry will have an eternal life after death, with evergreen excuses for repackaging, anniversary events, and other avenues to fresh hype. So the more things change, the more they stay the same. The cliché applies well to the Potter series' big finish, Harry Potter and the Deathly Hallows—Part 2, both in J.K. Rowling's novel and its cinematic adaptation. Thematically, like any good myth, the Harry Potter story comes full circle, with a heroic homecoming and the promise of more adventures, if only in our imaginations. Splitting Rowling's epic tome into two films—both directed by David Yates—was obviously a canny capitalist move by Warner Brothers, but it also has proved to be a sound artistic choice. Though Part 1 felt a bit tepid and, by its nature, narratively unfulfilled, the agreeably busy Part 2 finds a brisker pace and, of course, dramatizes more momentous events. Harry (Daniel Radcliffe), Hermione (Emma Watson) and Ron (Rupert Grint) continue to seek the magical Horcruxes that are fragments of the soul of the dark lord Voldemort (Ralph Fiennes). If they succeed, Harry may be able to vanquish Voldemort; if they fail, he hasn't a prayer. For his part, Voldemort senses his vulnerability, so he continues to stay on the offensive by rallying his evil minions and intimidating Harry from afar. Part 2 continues to explore the character of this magical war and its effects on the men, women, and children on both sides of the magical community. There's an element of civil war drama in the split between, say, the once-united Hogwarts "houses" of Gryffindor and Slytherin, and a potential WWII allegory in situations where fascism demands collaboration or death. The war holds people physically—and, at times, emotionally—apart, death takes people before their time, and ideologies by which people have ordered their lives hang in the balance. And nothing says, "Time to accelerate that virginal romance" like the threat of impending doom. The tightening grip of these high stakes helps to elevate the finale, as does an epic scale that's even more spectacular than usual. Hogwarts School of Witchcraft and Wizardry becomes the ultimate battleground, the beloved site reduced, in many places, to rubble. Fans will, of course, thrill at seeing the graphic versions of long-held secrets being revealed and other events, whether they be epochal (the long-anticipated final showdown between Harry and Voldemort) or passing attractions (like getting to see Dame Maggie Smith, as the matronly Professor McGonagall, in a bit of serious wand-flinging action ). This being the finale, Rowling's story (adapted, once more with feeling, by screenwriter Steve Kloves) does justice to as many characters as possible, with special attention to good ol' Neville Longbottom (Matthew Lewis) and wand-seller Ollivander (John Hurt), the latter's presence bringing to mind Potter's incipience as a magician. The rest of the hardest-working cast in British show business includes newcomers Ciarán Hinds and Kelly Macdonald and return engagments from the great Alan Rickman as the slippery Severus Snape, Gary Oldman, Jason Isaacs, Robbie Coltrane, Julie Walters, Jim Broadbent, and (blink and you'll miss 'er) Emma Thompson, among many others. You know it's a big movie when the credits include "fire fighters" and a "weather consultant," but the MVPs continue to be folks like production designer Stuart Craig, cinematographer Eduardo Serra, costume designer Jany Temime, and visual effects supervisor Tim Burke. The eye-popping bigness of the big finish will likely put Potter among the Best Picture finalists at the Oscars, in line with the final-fantasy precedent set by The Lord of the Rings: Return of the King. When the dust settles, there is the much-discussed epilogue, and while it is sensible and—on paper, so to speak—poignant, one might argue it's a bit obvious, neat and truncated (unlike most other much-anticipated pop-culture endings, this one's substance can be wholly summarized in a short sentence). It's almost as if Rowling (and Kloves) worried that any kind of substantial dialogue would stand a better chance of killing the mood than adding nuance, so best just to get out while the getting is good. After the high drama, I suppose one can't begrudge Rowling a bit of simple warm fuzziness. 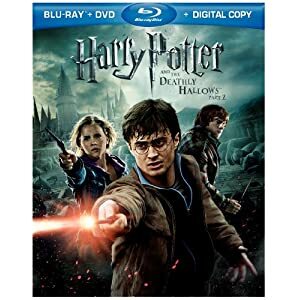 Warner sends home the first (but surely not the last) special edition of the last Harry Potter film in a Blu-ray + DVD + Digital Copy combo pack that showcases near-perfect hi-def picture and sound. The darkly inviting picture looks just as it did in theaters in this home-video presentation, with exceptional detail and texture, carefully calibrated contrast, and deep, true hues (where the film indulges them). The all-important black level here runs deep, and digital artifacting is held entirely at bay. Meanwhile, the DTS-HD Master Audio 5.1 surround mix is reference-quality stuff, a dizzyingly immersive experience with soul-rattling effects, serious low-end potency, and robust music, as well as pin-drop clarity across the board, from those thunderous effects to the less emphatic aural moments. WB's Cadillac feature, the Maximum Movie Mode (2:47:25), turns up here, along with separate menu access to the presentation's "Focus Points" (26:27, HD): "Aberforth Dumbledore," "Deathly Hallows Costume Changes," "Harry Returns to Hogwarts," "The Hogwarts Shield," "The Room of Requirement Set," "The Fiery Escape," "Neville's Stand" and "Molly and Bellatrix." The MMM is a sort of deluxe video commentary artfully bringing together those Focus Point featurettes, additional set footage, film footage (including deleted scenes), and video chat from cast and crew members. Additional featurettes include "Aberforth Dumbledore" (2:37, HD), regarding Ciaran Hinds' transformation; "Deathly Hallows Costume Changes" (3:13, HD); "Harry Returns to Hogwarts" (3:21, HD), focusing on the filming of a key scene; "The Hogwarts Shield" (2:27, HD); "The Room of Requirement" (3:13, HD), "The Fiery Escape" (3:49, HD), a look at a bit of stunt work; more scene focuses in "Neville's Stand"(4:15, HD) and "Molly Takes Down Bellatrix" (3:27, HD); and "Final Farewells from Cast and Crew" (3:07, HD). The second disc kicks off with the most anticipated bonus feature, "A Conversation with J.K. Rowling and Daniel Radcliffe" (53:03, HD), a satisfying, candid chat about the book and movie franchise. "The Goblins of Gringotts" (10:56, HD) proves self-explanatory, while "The Women of Harry Potter" (22:31, HD) finds Rowling discussing same. Eight "Deleted Scenes" (6:33, HD) include "Sc. 184 - Shell Cottage" (1:16, HD), "Sc. 185 - Harry and Luna at Dobby's Grave on the Beach" (1:51, HD), "Sc. 215 - Hog's Head" (:53, HD), "Sc. 229E - Marble Staircase, Harry and Ginny" (:31, HD), "Sc. 242 - Wooden Bridge" (:30, HD), "Sc. 245 - Hogwarts' Battlements" (:23, HD), "Sc. 274 - Slytherin Dungeons" (:42, HD), and "Sc. 346G - Marble Staircase, Ron and Hermione" (:23, HD). "Warner Brothers Studio Tour London" (1:33, HD) is a promo for "The Making of Harry Potter" tour set to open in Spring 2012, while "Pottermore" (1:07, HD) promotes Rowling's new all-things-Potter website. And of course the set includes a DVD and access to an UltraViolet Digital Copy for online storage, streaming, and download capability through Flixster. All site content © 2000-2019 Peter Canavese. Page generated at 04/25/2019 08:54:23PM.